What is the most efficient way to express a professional potential of a hotel and restaurant official? Definitely Restaurant Manager Resume Template! Completed in a handy A4 size, it will be convenient in the use for both you and your potential employer. This easy-to-edit item can be tweaked on the fly in order to satisfy your needs fully. Being print-ready, this theme can be filled out and be ready to go live in the blink of an eye. Thanks to free Google fonts, which come in the pack, you will be able to switch the typography hassle-free. 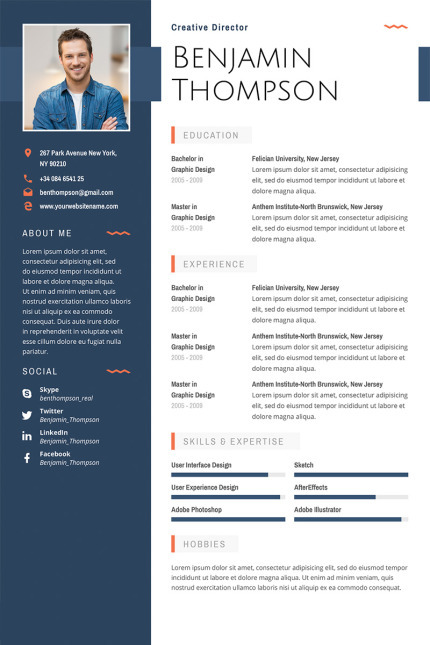 This quick and easy customizable resume is available in PSD, AI, and PDF formats, which you can simply modify. In addition to a professional resume layout, you will also get a ready-made business card design. Try out Restaurant Manager Resume Template right now!